In a commodity business like petroleum, the difference between success and failure is often razor thin. It can be measured in pennies per gallon of gas or fractions of a point on a credit card transaction. At Liberty Petroleum, we leverage our collective purchasing power, our extensive knowledge of the petroleum marketplace, and our insights into the intricacies of card processing to ensure that you have every advantage. We negotiate with suppliers to ensure that you have a secure supply of fuel at a price that is both predictable and competitive. And we work with our merchant processing vendor to contain credit and debit card processing fees. Our goal is to give you the freedom to compete by allowing you to focus on running your business profitably. Find out the advantages of having the freedom to compete. "I have been in this business for over 30 years and have never had such a positive bottom line. 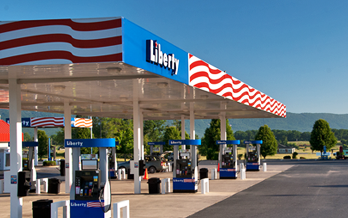 Liberty gave me the tools to expand my customer base and increase my fuel sales which has translated into enhanced profitability."